*Most* women love jewelry. It’s true. From the time we were little and playing dress up, we’ve been attracted to sparkly things that accessorize our outfits. As we’ve gotten older, our jewelry has typically increased in value. However, once we become moms, something changes for some of us. Some children grab more than other and due to the desire not to ruin our favorite pieces, we end up giving up jewelry all together. We’ll still wear our rings, but the necklaces, earrings, and fancy bracelets vanish for awhile. Personally speaking, I know that my children were over two before I started trying to wear jewelry again. Even then, it’s a fine line walked to make sure that over-excited children don’t grab valuable pieces and tear them. I’m here to tell you that you don’t have to sacrifice any longer. Whether you are a mom reading this post and looking to buy yourself something, or you are a partner/grandparent/friend looking for something special for the nursing mom in your life, I’ve got you covered. 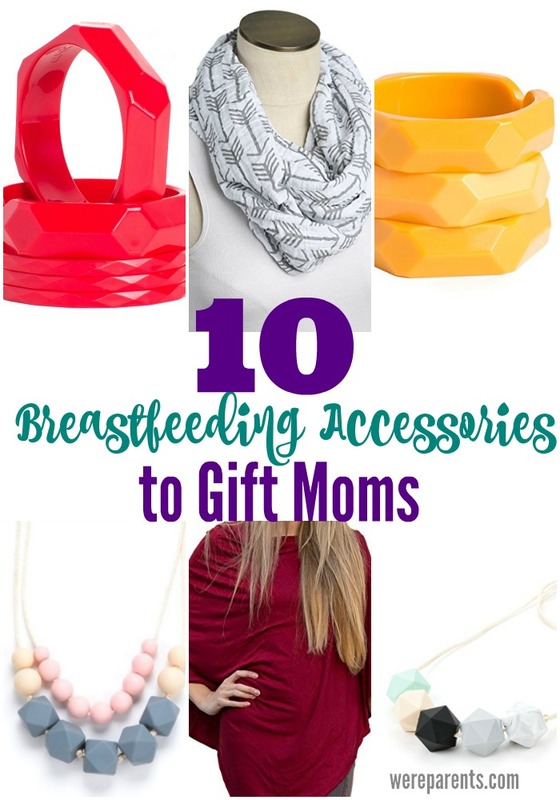 Our Breastfeeding Accessories to Gift Moms post will give you affordable, stylish options. Jewelry options that are safe for babies to chew on anytime. The jewelry is also extremely durable, so you don’t have to worry about them breaking. All the pieces showcased in this post also have more than one use. All the jewelry doubles as toys for your littles while out or at home. The shawl and scarves can be used indefinitely, even after your littles are bigger. These are some of our favorite Amazon finds for breastfeeding accessories to gift moms, but we’ve got some even cooler news! Right now, if you click on either of the Wee Likey bracelets (Number 1&2), you can save 40% off! That mean’s you can get a 3 or 5 set of bracelets for just $14.99! And they double as toys when you are out and about! Use code: VIParent at checkout. I remember sitting at my baby shower with our first. My sister made me up this awesome gift basket basket for things I would need postpartum. Most of it, I understood. There were pads and snacks, a notebook, chapstick, and so much more. But there were a few things, like tucks pads and a peri bottle, that I looked in confusion as all the moms in the room busted out laughing. They were all in on this secret that I had no clue about. But soon I would learn. My sister, to the best of her ability, would guide me those 41+ weeks through my pregnancy. Teaching me about what to expect both during pregnancy and postpartum. Still, there was so much that she could never teach that I would just have to experience on my own. So much of parenting is learning as you go, however, you can also learn so much from others’ experiences. Today, I want to share with you our New Moms Morning Routine. Whether this is your first baby or your fifth, each time you have a new and unique adjustment period. 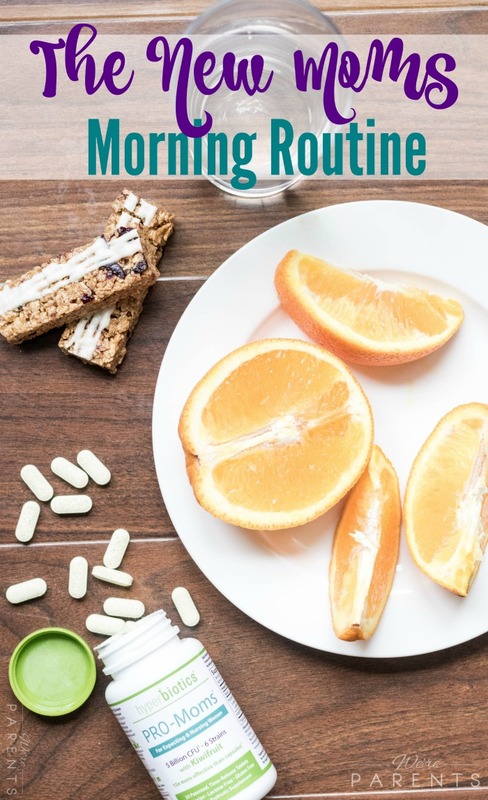 One of the best things that you can do for your mental health is to establish a morning routine as quickly as you can. Getting into a groove will leaving you feeling refreshed and ready to tackle every day with energy. Here’s our New Moms Morning Routine in 5 simple steps. I promise if you do each of these things, you will feel much better every day. Not going to lie, not everyday will be sunshine and rainbows, but overall, much better! Okay, if we are being honest here, you likely aren’t going to have time to shower every morning. While many other sites recommend meditating, exercising, or journaling, the truth is we don’t always have time for that. 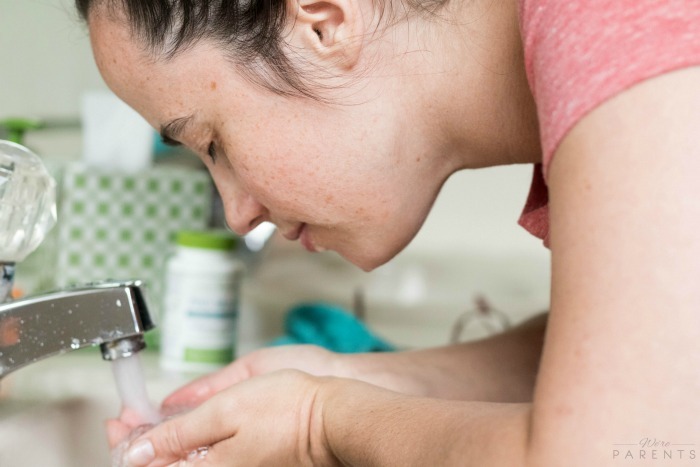 We think those are great ideas, but simply washing your face in the morning will have you feeling like a new person. This doesn’t have to be something outrageous. I’m not asking you to make yourself poached eggs with crepes and berry compote every morning (although that does sound delish). Make yourself a smoothie. Hard boil eggs once a week and eat two throughout the week. Or even avocado toast. Breastfeeding? 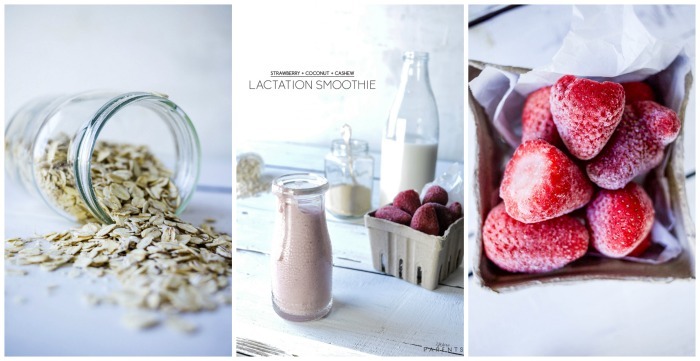 Check out our lactation recipes. 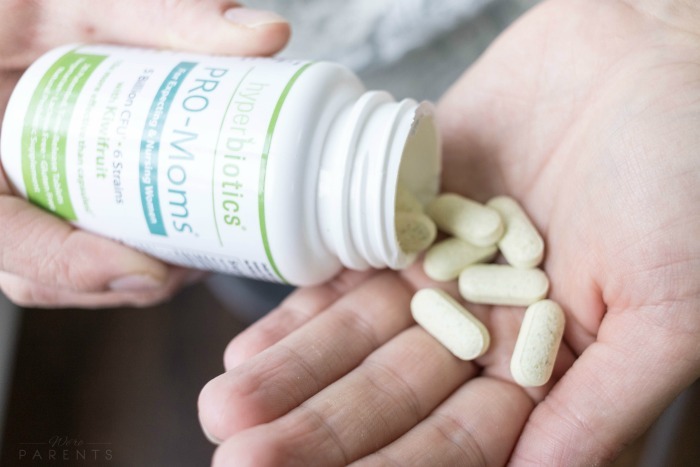 I honestly wish someone told me about probiotics when I was a young adult, even before having kids, but it wasn’t until I had given birth with my first that I learned about them. Probiotics have multiple functions, but in this scenario they provide temporary relief for anxiety, depression, and overall mental health. Hyperbiotics, a probiotic brand found at your local Target, encourages healthy, regular bowl movements (which if you’ve given birth know just how important help in that department is!). The Pro-Moms blend is prefect for both pregnant and nursing moms because it encourages full nutrient absorption which aids in a healthier immune system. Pro-Moms also helps produce essential B vitamins and contains natural folate. It also doesn’t have to be refrigerated, so you can keep it by your bedside and always remember to take it. 4. Take a postnatal vitamin (or continue your prenatal vitamins). You just had a baby! You body needs all those vitamins and nutrients replenished as quickly as possible. 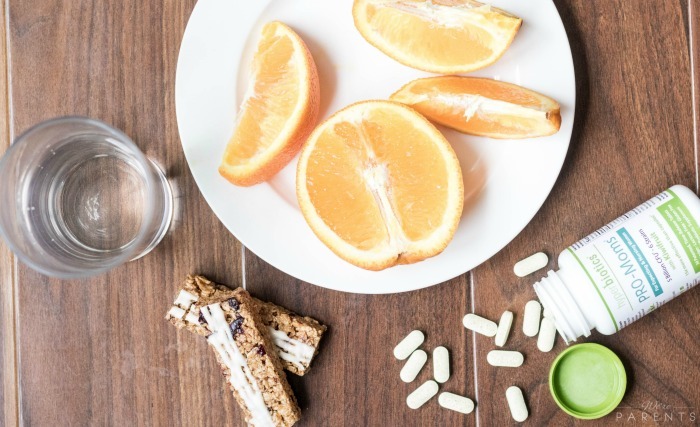 It’s really important to continue taking your vitamins every day, but especially a quality postnatal or prenatal for the first 6 weeks after childbirth. 5. Fill up a water bottle. I know some of you are going to hate me for this, but you need water. Put down the juice and soda, and pick up a bottle. Fill it with water as often as you need. You should continuously feel hydrated and not parched. Drink until you feel quenched. Don’t care for water? Try flavoring it (Pinterest has a bajillion different ideas) or try coconut water. If you are a breastfeeding mama, I try to aim for 64oz a day. optimizing your best digestive health. Specifically speaking about Hyperbiotics formulas – they are vegetarian, non-GMO, free of lactose, gluten, and sugar. There’s also no soy, nuts, iron, artificial flavors or colors, and no preservatives. 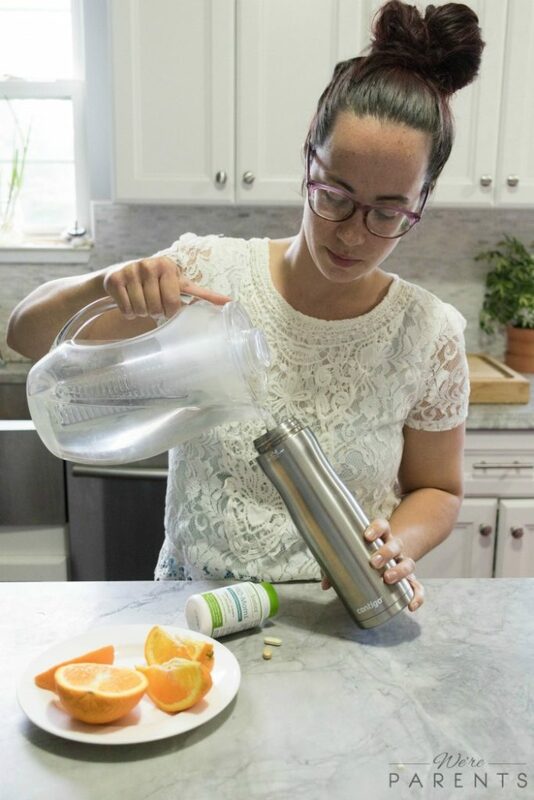 Also, unlikely many other probiotic companies, Hyperbiotics blends don’t have to be refrigerated, which means you can take them with you anywhere. They use a patented manufacturing process called LiveBac® that guarantees their blends for 18 months after manufacturing with no refrigeration. Hyperbiotics isn’t just for MOMS! There’s a blend specifically for women and one for kids, as well as two additional blends for I encourage you to live healthier days by taking Hyperbiotics blend daily. #FollowYourGut to Target and purchase them today! To learn more about Hyperbiotics, visit www.hyperbiotics.com. Disclosure: Affiliate links contained within this post. Summer is so close I can almost taste the salt in the air. Every year since having kids, we have found ourselves at the beach more and more. Days that we aren’t at the beach, we find ourselves lost for time as we play for hours and hours outdoors. We love it. Whether with friends or family, outdoor time is the best. The girls love playing, I love gardening, and Andrew…well, he does something. (not always sure what he’s doing). As the girls get bigger though, I’ve come to the realization that chalk and bubbles aren’t going to work as entertainment outdoors for much longer. We also, for the first time, have a decent yard where grass is actually growing. Because of that, we’ve been looking for some fun outdoor activities that we can entertain our guests with. Over the last few weeks, I’ve found a lot of really cool outdoor activities that I wanted to share with each of you. These are just 30+ Outdoor Activities You Didn’t Know You Could Buy, but we’re sure there are more. 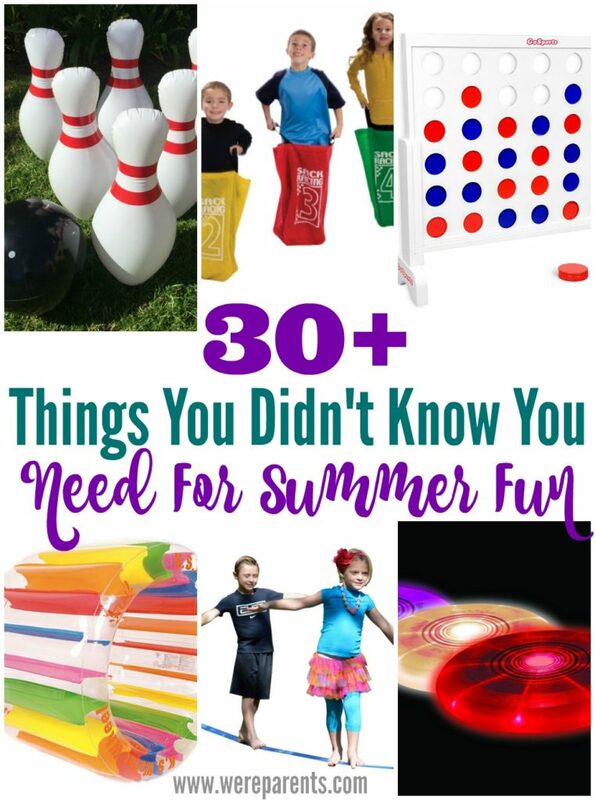 What’s your go to unique fun activity during the summer? Leave a comment letting us know!